Someone has set out to recreate all 42 decks of the Star Trek Enterprise D ship in VR. 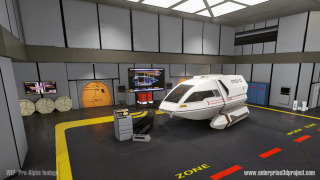 As far as VR recreation projects go, this one has us impressed, and you can already take a virtual tour some of the areas that Jason, the 3D artist behind the project, has completed. The project is huge - especially for just one person - and will create the entirety of the USS Enterprise NCC-1701-D that can be explored using the Oculus. "Fans would be able to visit engineering via the turbolift, or walk from Deck 36 to Deck 5 to see the Arboretum," Jason said on the Enterprise 3D Project website, adding that it would serve as a virtual museum for fans. Once he's completed the Enterprise D, the project could evolve to include a populated ship, other locations like the Starfleet Headquarters, as well as "online play with other Star Trek fans." However, building the ship itself is Jason's only goal currently, as there are some hurdles he'll need to face, including potential licensing issues. "If there is interest from the fanbase, I will try and pursue this project from a more serious standpoint," Jason said, adding that the project would then need some crowdfunding to hire other developers and artists. "There is also the matter of licensing. I will seek CBS' blessing to continue to create this. But to release it as a product, licensing will have to be procured." Until then, Jason will continue to build a "truly immersive Enterprise experience." Mobile VR has landed, so what's the point in the desktop?